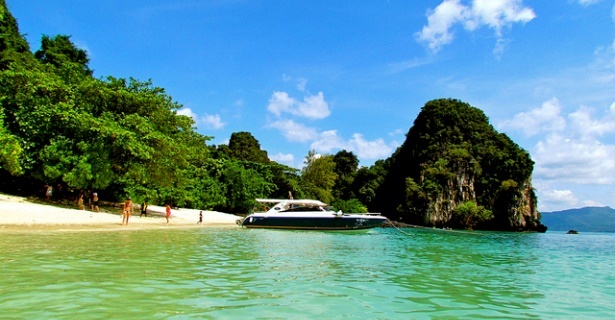 Whenever luxurious Thailand beaches are mentioned, Phuket usually comes to mind. After all, it’s Thailand’s original tailor-made tropical getaway. Located on the Andaman coast of southwest Thailand, Phuket is the largest of the country’s islands, although its considerable size – a little bit smaller than Singapore – does not convey the feeling that you are surrounded with water unless you stay in a Phuket beach resort. Jet-setters flock to Phuket in droves, and the tourist traffic they create translates to more than a thousand hotels in Phuket Thailand to choose from. Phuket is blessed with shimmering jade waters and endless white sand beaches; which give you a promise of a summer to remember, the best resorts in Phuket, Thailand live up to very high expectations. The highly developed beaches of Patong and Karon on the central west coast are littered with 5-star resorts, posh spas and luxury hotels in Phuket. Patong, as the busiest beach, is the center of island nightlife, shopping and hedonism. To snag steep Phuket hotel deals, book more than three months ahead as hostels in Phuket and other more affordable rooms in better locations fill up two months prior. Patong also has a very lively night market filled with street food stalls. One of the two largest shopping malls in the island, Jungceylon, is here. The bay of the same name is also an inviting playground to novice scuba divers. The heart of Thailand’s Sin City by the Sea is Soi Bangla – it’s awash with blinding neon lights, deluged with disco houses and go-go bars, and sprinkled with rest rooms labelled girl, boy and “katoey” (ladyboys). But if your idea of pampering is getting gently pulled and pummelled in a quiet beachside hut with the sea breeze blowing in, you may want to head 15 kilometers north where it’s less touristy. The most sumptuous villas and the best hotels in Phuket hug the hillsides of Surin and overlook Pansea Bay. Kamala and Bang Tao are also generally more relaxed and out of earshot of riotous parties. Leave the cocoon of your lounge chair and trace back the island’s Sino-Portuguese history in Old Phuket. Hunt down Buddhist amulets in narrow alleyways, and dig into the Sino-Portuguese fusion in one of the eateries nearby. For a change of scenery into one that is lush and verdant, jungle-trek into Phra Taew National Park in the interior of the island; the area is largely unvisited by foreigners and has remained relatively undiluted. Due to its off-beat location, Chalong Bay on the southeast tip of the island has plenty of cheap hotels in Phuket. Kite surfers take to the skies during winter, while water lovers go on a sea kayak during low tide to get into one of the many grottoes, or sunset-sail on a yacht in Phang Nga Bay and have their picture taken in front of the iconic James Bond Island where parts of the 1974 ‘Man with the Golden Gun’ were shot. Offshore is the well-endowed underwater territory of Racha Noi and Racha Yai which offer an abundant sighting of sea turtles and manta rays and a staggering forest of hard corals sloping down into the unknown. I these islands, because of limited accommodation in Phuket, Thailand – just some bungalows and a few resorts in Racha Yai and none in Racha Noi – they are ideal for simply kicking back and letting time slip away. Book online to find where to stay in Phuket and reserve a room at the best hotel in Phuket, Thailand.